Microcontroller programming become much simple if we use high level language like C. But it doesn't means that we could ignore the assembly language. In some situations, we might me forced to use a bit of assembly codes. Assembly language is a symbolic representation of a processor's native code. Using machine code allows the programmer to control precisely what the processor does. It offers a great deal of power to use all of the features of the processor. The resulting program is normally very fast and very compact. Using assembly programs, timings, for example, could be calculated very precisely. Here, I am just posting some basic C codes and their corresponding assembly (generated by msp430-gcc). By comparing the compiler generated assembly and the source C file, I hope, we will get a good idea of how the compiler effectively utilize the stack, various addressing modes, functions, global variables, local variables, pointers etc etc. For getting the disassembled view of the final hex code, we could use the msp430-objdump command. Disassembled view is the ideal one and it will contain each and every instruction from the reset address to the end of the program. 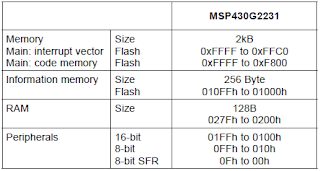 [Today I found an interesting and simple msp430 assembler named naken430asm. Below C program could be used for the purpose. 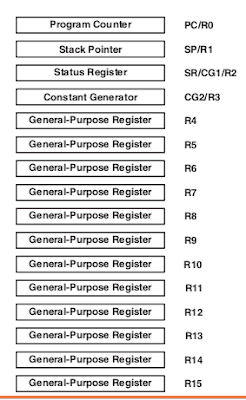 Here , in line 14, the content in register r1(stack pointer) is moved to register r4. Initially the top of the stack ie 0x0280 is loaded (not shown in the above code) to r1 before the main function. r4 is generally used as frame pointer. In the current function main, if there are local variables, then the frame pointer will be used as reference for arranging the local variables in stack. But here there are no local variables used. But as a general procedure, compiler always uses the line. In next line 15, the frame pointer is set two bytes above the top of stack. In next line 16, number 23168 is moved to register WDTCTL. Now the line 19 and 20 constitutes an infinite loop. Note: Using infinite loop is not a proper and ideal way to keep the processor static. This infinite loop still consumes power from the battery or equivalent source. There are some efficient power saving technique in the MSP430. This could be done by configuring the status register accordingly.. Here, I used a three local variables ie char, int and long int . 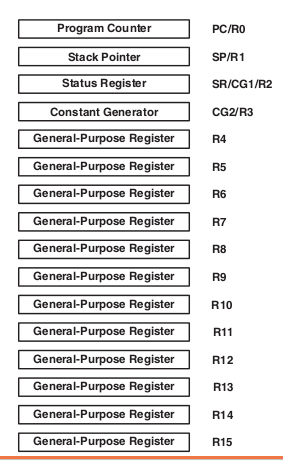 So a total of 8 bytes are to be reserved in stack. So in step 16, SP is decremented by 8. In this case, delay function is called from main. The argument of the function is 10000 . This is introduced to the function via r15. Similarly, the return value from the delay function is obtained at the same argument register r15. The while loop (delay) is to obtain a small delay of about 1 second aprox so that we could observe the led blinking. In case of a function call, what actually happening is, the assembler will convert the pseudo instruction 'call dst' to a combination of real instruction. 1>address of the function is stored in a temp. The above code is a hello world example to illustrate pointers. A pointer hold an address. Pointer itself have a location in ram where the address of the pointed variable is stored. In above case, int a is defined and assigned value 43 to it. Now, the address of local variable 'a' is moved to p. For this, at first the address of the local variable a is obtained at r15. Then it is moved to the location of pointer ie -6(r4). Now, the pointer holds the address of local variable a.